Two things struck me about Humphrey Bogart in this picture: One, he’s in color. Like his contemporary Cary Grant, Bogart seemed to lose a little bit with the Technicolor revolution. The two stars were made for black and white. 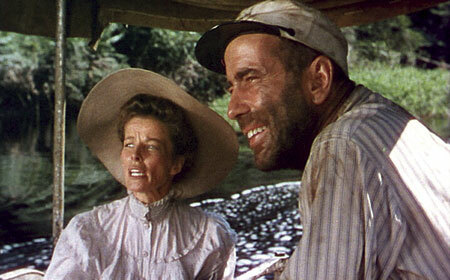 Bright colors dulled their edge, even in terrific entertainments such as North by Northwest or The African Queen. The other was the looseness and the warmth with which he played the role of Charlie Allnut, such as in the well-known sequence where he imitates hippos and monkeys. The pensiveness, the mistrust, that is such a hallmark of the Bogart persona is almost entirely gone, replaced by a sort of dimwitted generosity. Allnut’s harshest moment, when he drinks too much and tells off Katharine Hepburn’s Rose Thayer, doesn’t come as a shock to the audience, because we know that Bogie has demons, even if Allnut hasn’t showed them. John Huston, who pushed Bogart to new heights in The Treasure of the Sierra Madre, does the same here, but has Bogart fashioning an almost entirely new character. Anyone who believes Bogart was more of a presence in movies rather than an actor should view Sierra Madre, In a Lonely Place, and this film in sequence. This is likely the most “Hollywood” film Bogart ever made—and the story has been replicated so many teams that it renders the plot of this film somewhat mundane even if it wasn’t necessary Huston’s fault: A mismatched team comes together through adversity and achieves a common objective. 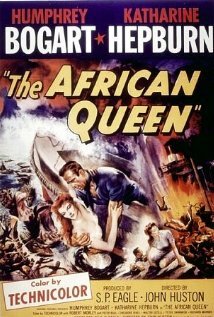 But The African Queen makes a choice early on that similar films today would likely avoid. After some initial bickering (Thayer tosses Allnut’s gin overboard! ), the two leads quickly develop and affection and loyalty for each other than lasts throughout the film. I’m afraid a more modern take—in a bid to recreate the chemistry of the classics—would mistakenly have its couple tussle throughout the story to build will-they-or-won-t-they tension. Huston wisely does away with that question quickly, so as to focus on the questions of endurance and survival. It also produces a more poignant ending. You really do believe that Bogart and Hepburn have reached the point where the thought of living without the other is too much to bear. The Blu Ray presentation of the film is stunning—and beautifully renders the on-location setting in Africa with the verisimilitude that Huston felt was so critical. Part of what makes The African Queen so enduring is that unlike the other so-called “exotic” pictures of the day, this wasn’t filmed in some backlot. The oppressive heat, the conditions, the crocodiles, the exhaustion on the actors’ faces—all of it feels authentic. And Blu Ray is the best format to bring it all to life. One final note: check out the promotional poster, which promises pulp adventure with Hepburn as a flame-haired temptress, her blouse askew. I wonder how many theater-goers were disappointed to discover she plays a prim missionary. This entry was posted in 30 in 30, Blu ray, Chemistry Sets by James Oliphant. Bookmark the permalink.